The positive side about going MIA is that when I get back I have new things to talk about. Sometimes I feel somewhat uninspired to share my skincare routine, fearing that I may be overly repetitive. If you’ve been with me for a while, you know that I am too loyal to some of my skincare routines. I am not the type to try new products in bulk, as I prefer to introduce one new product at the time and give it an almost analytical and meticulous test. Figuring out what makes my skin look and feel the best is very important for me, but this method also helps me easily isolate which product may cause skin issues like irritation, breakouts, etc. I highly recommend that you take this approach as well, in order to build a skincare regimen that works best for you. My basic skincare routine has actually changed quite a bit during the past few months. I have been testing new products & techniques and ventured out of my comfort zone–thankfully without experiencing any skin disasters (except when I gave in to a peanut butter craving). In this post, I am going to share my current, pampering skin care routine. This is one that I follow when I take an hour for myself, either late at night during the week or the weekend. As I mentioned on social media, I have been testing all the oil cleansers that I can get my hands on (if you have any recommendations, please leave a comment below). I believe that a good oil cleanser is a necessity for everyone who wears sunscreen/makeup daily. With that said, my goal is to find the best oil cleansers and create a guide like I did with face sunscreens (in case you missed it, you can check out my Guide to Face Sunscreens here). Kahina’s Oil Cleanser* is definitely one of the best ones that I have tried so far. It’s rich enough to give a satisfying slip when I massage the skin and powerful enough to lift product off the skin, while still rinsing off easier than most cleansing oils. When I am feeling lazy, I get a few pumps in my hand, hop in the shower, and use while having my shower. I don’t recommend cleansing your face in the shower, especially if you use warm/hot water, but I have my days when I am way too tired and I do that. It rinses off completely, leaving no residue on the skin. It also contains anti-inflammatory ingredients, so it feels soothing while it’s on the skin. It’s wonderful, and it will definitely make it to my list of favorite oil cleansers. Available at Kahina’s website here. I have been alternating between a few different face masks, but these I have been using the most. I recently got a new jar of YULI Pure Mask, which remains a favorite of mine for gentle, effective exfoliation. I also got a new jar of the Twelve Beauty London Mask*, which I was first introduced to by Boxwalla (a subscription box). You can read my full review of the YULI Pure mask here. The Twelve London Mask is a pre-mixed “detoxifying” mask, that feels creamy and soothing. It contains clay for a deep cleanse, but is quite hydrating and moisturizing as well(it doesn’t leave my skin parched as clay-based masks tend to do). I like to use these separately or combine them for the perfect multi-masking experience. When I multi-mask, I use YULI Pure on my T-zone and the Twelve London on the rest of my face. I am almost out of it, so I can definitely say that the Nazan Schnapp Sublime Hydrating Treatment Essence* was a great find (at The Detox Market, which is currently having a sale–check it out here). This hydrating toner contains the perfect balance of hydrating and soothing ingredients. What I can’t say is that I would pick this over the MUN Anarose toner (still my favorite one, because I find it the most calming and soothing to my skin), but I enjoyed it and look forward to continuing to use it until my last drop. Another pleasant discovery has been the new Glow Recipe Watermelon Glow Jelly Sheet Mask. This is a one-use, hydrating gel sheet mask. I use this mainly before I go out if want my skin to look extra nice under makeup, but I also like it as a once-a-week, pampering face mask. It is hydrating, cooling, and soothing. I absolutely recommend it if you are struggling with dehydrated skin during Summer, as your skin-prep before stepping out in the evening. It leaves a slightly sticky film on the skin (as you would expect from a product containing a large amount of hyaluronic acid), which happens to work very well under face makeup. 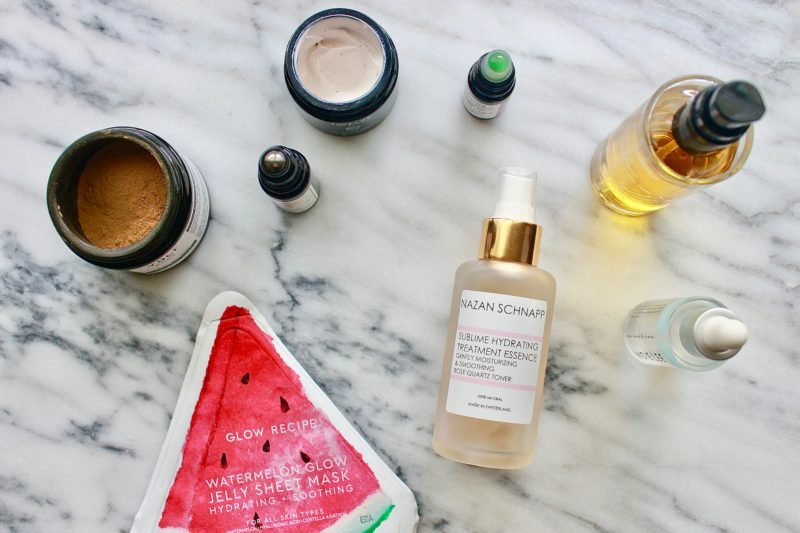 It’s like a watermelon popsicle for your skin. It also contains brightening ingredients, so it’s really perfect for Summer when we are more likely to develop dark spots. And for those who asked me on social media–yes, I prefer the sheet masks over the Watermelon Glow Sleeping Mask that comes in the jar. I buy these at Sephora online. I am still very much obsessed with Indie Lee’s Squalane oil. I have been alternating it with another face oil that I am currently testing, but I am so happy with the results from this simple face oil that I don’t really see a reason to experiment with other products. I am almost at the end of my second bottle and plan to buy a third one. 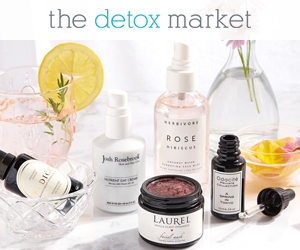 Available at The Detox Market. I still love the formula of this concentrated, lightweight serum for the eye area. It provides enough moisture to soften the eye area and is full of luxurious ingredients that target the needs of delicate, thinner skin, such as vitamin C, vitamin C-rich plant oils, and other antioxidant-rich extracts. And I would lie if I didn’t admit that the roll-on applicator feels so good under my eyes–I could be rolling all day. At Maya Chia Beauty here. In case you missed my post on Instagram (and the awesome 6 winner-giveaway), Odacitè has launched a luxe, lip serum that hydrates and moisturizes, called Aventurine Kiss Lip Serum* It leaves a pleasant, lightweight layer of oil on the lips that feels soothing and comfortable (and works great as a base for more matte lipsticks that tend to be drying). Available here. That’s it for today. I plan on filming my full skincare routine with the other new product additions that I did not mention in this post (including the treatments that make my pores look almost invisible–yup I said that) and the tools I have been using for extra benefits. Stay tuned, and keep an eye on my Instagram page for my newest giveaway starting soon.